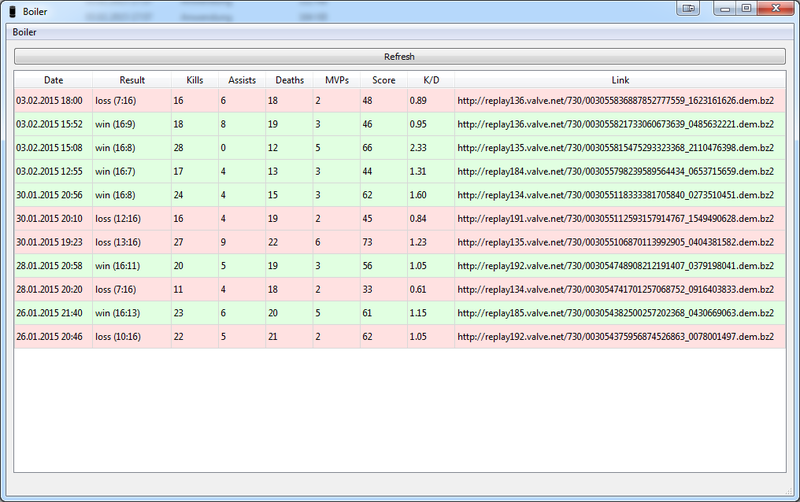 Boiler is a small tool that fetches your CS:GO match history. Download Boiler.rar and dependencies.rar and extract both archives into the same directory. Simply start Boiler.exe and hit the refresh button to update the match list if required. If you check Boiler->Autostart Daemon BoilerDaemon.exe will launch together with Windows and update your match list everytime you close csgo. Do note that Boiler will tell steam you are currently playing CS:GO so i would suggest you turn it off when you are finished.